MRRC MC12005 Cobra roadster w/hardtop, #19 yellow. Preorder now! 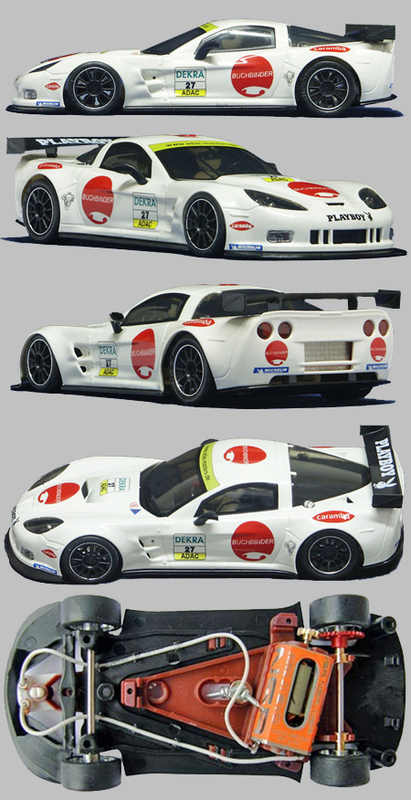 MRRC MC12006 Cobra roadster w/LeMans hardtop. Preorder now! 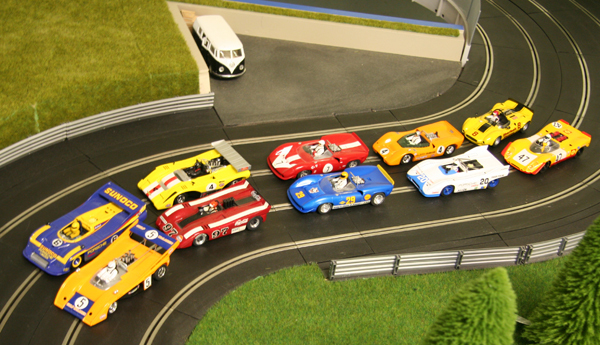 Arrow Slot cars are designed to compete with Slot It, Avant Slot, NSR, and similar cars developed for high-end organized open competition. 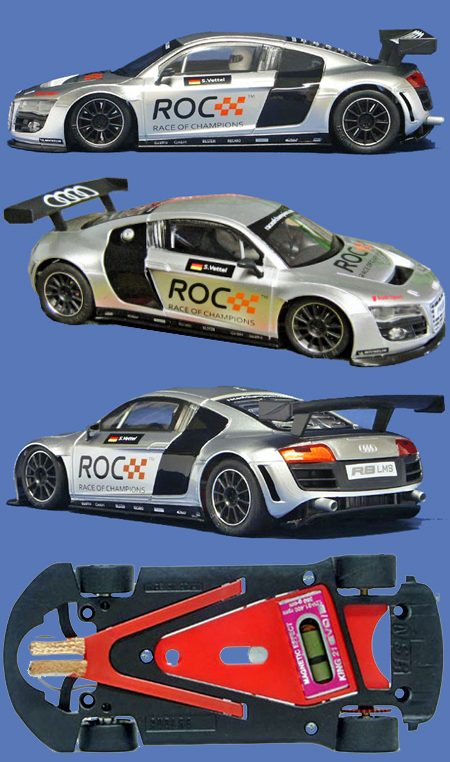 They are powered by Scale Auto motors and feature a podded rear end, aluminum wheels, and other pro-racing features. In recent months more favorable dollar/euro exchange rates have brought the prices of NSR cars below $100, making them a better value along with their outstanding on-track performance. 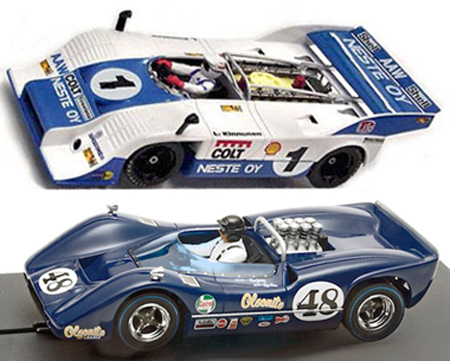 You may recall an article we did some time ago in which we corrected the principal shortcomings of the Monogram Lola T70. We got the body down out of the stratosphere and solved the problem of insufficient clearance under the spur gear. We not only made the car look better; we also turned it into a pretty decent runner. Still, we couldn’t help thinking that the whole chassis should have been designed differently to begin with, especially in regard to the magnet installation. 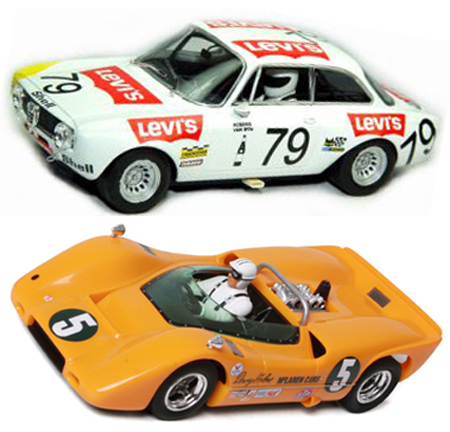 What we really wanted was a car that would run with our highly successful modified Fly classic cars. So, we thought, why not just put the Monogram Lola body on a Fly chassis? It wouldn’t be the first time we had rebuilt a car around a Fly chassis. We had previously done it with a Spirit Porsche 936, totally transforming the car. We have lots of different chassis floating around the shop, including several of the Fly classics, so we took a body off a Monogram 85-4826 George Follmer Lola and began test fitting chassis to it. 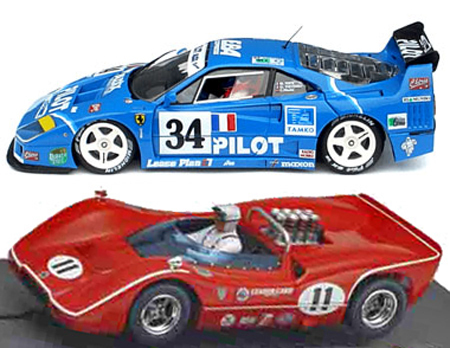 The Fly Ferrari 512S chassis, we discovered, is a near-perfect fir for the Lola body. It needed only some trimming at the front, a new body mount at the rear, and two new front mounts to match the position of the body’s front mounting posts to look like body and chassis were made for each other. 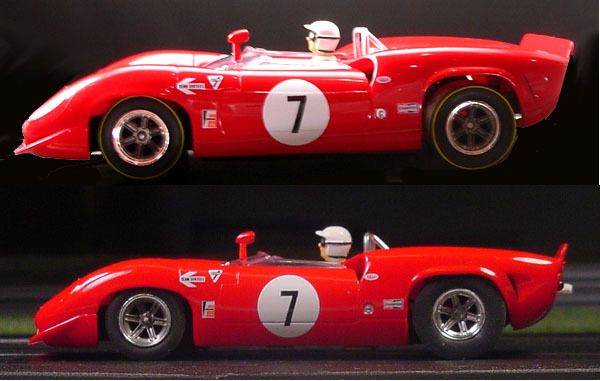 The chassis also needed a very slight change in the wheelbase, but we noticed that both the front and rear wheels fell withing the body’s wheel openings, just not quite centered. So, instead of cutting up the chassis we decided to do a little work on the rear wheel openings instead, moving the center of the rear wheel openings slightly aft to accommodate the wheelbase of the chassis. Here you see what we’ve done to alter the rear wheel openings. We CA glued in pieces of strip styrene and used a Moto-tool to shape them to the desired configuration. We have made the wheel opening smaller; it fits more snugly around the rear tires while still giving adequate clearance. With the trimming, filling, and sanding done and a coat of paint on the body this is how it looks. The wheels and tires are spares for a Fly BMW 3.5CSL. The Fly Ferrari chassis shown here with the new rear body mount made from sheet styrene and mounted by drilling the screw hole for securing the motor pod to the chassis and using a 4-40 machine screw and nut. You can also see the new front body mounts, made from styrene tubing, as well as our standard Fly classic car modifications – replacing the stock gears with Scalextric ones and notching the pod to accept a bar magnet in place of the original cylindrical magnet. The blue tape around the magnet serves to make the magnet a tight fit and also to allow the magnet to be shimmed up or down slightly to adjust magnetic downforce when equalizing the car’s performance with other cars for closer racing. Also visible are the Slot It guide and the Pioneer 21K motor we swapped into the car. Neither requires any modifications to install. We had to cut a little out of the bottom of the interior tub to clear the magnet installation. Note that the Fly BMW wheels and tires are wider at both front and rear than the original Monogram wheels. Note also the trimming at the front of the chassis. At this point all that needs to be done to complete the running chassis is to install lead wires and braid. The pod modification for the bar magnet is seen here. From left to right, the stock pod, the pod with the notch for the bar magnet cut into it, and the pod with the bar magnet in place. This modification does not prevent the original cylindrical magnet from being swapped back in if desired, but you won’t want to. Th bar magnet gives plenty of downforce with improved drivability. 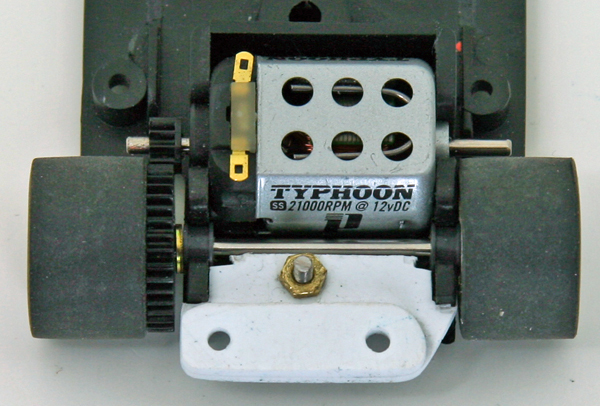 Note that the bar magnet is centered on the socket for the cylindrical magnet, which centers it on the car as a whole. 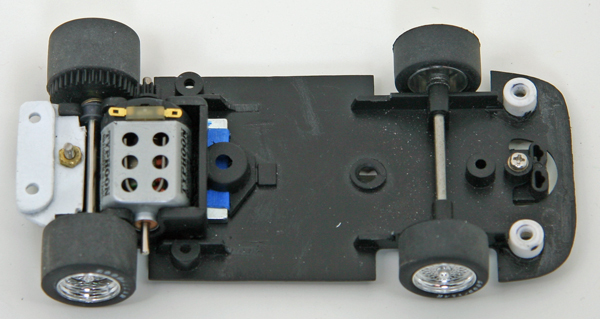 Here’s a closeup of the rear of the chassis showing the new body mount, the Scalextric gears, and the Pioneer motor. Note how the body mount is shaped to fit snugly into the pod so it can’t move when the nut is tightened down. The asymmetrical design of the pod places the mounting holes in the correct position to line up with the body posts. 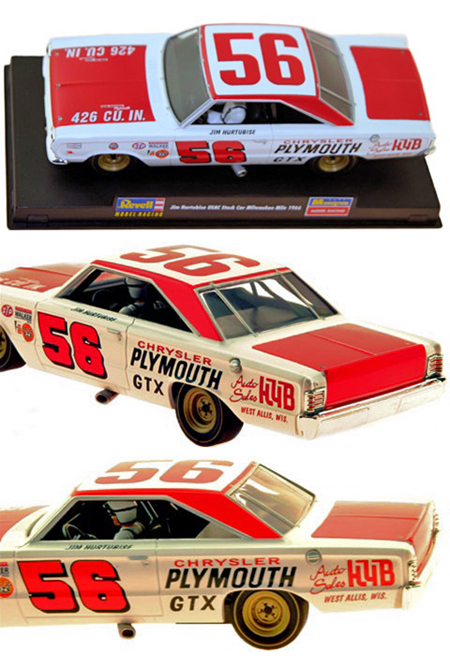 The body and interior are completely stock except for removing a bit of material from under the left side of the carburetor detail to clear the endbell and a little trimming of the bottom edge of the radiator air outlet to clear the top of the guide post, as well as the mod to the interior tub described above. We did replace the driver’s head with one in a full-face helmet. 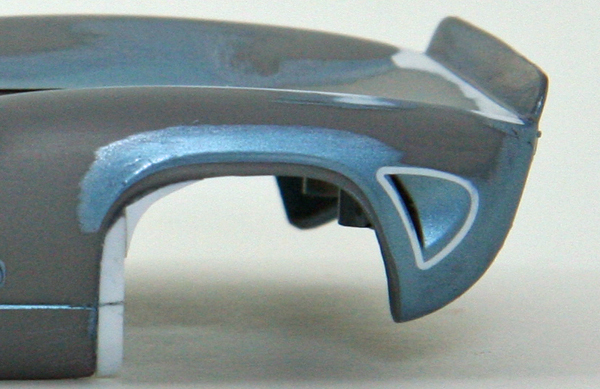 Overall body color is Testor Boyd’s True Blue Pearl Metallic over pale gray primer. We made the Kitt’y’s Guns and Ammo, Kalashnikitty, and ASR decals on an HP Photosmart inkjet printer. The rest of the decals are odds and ends from our decal box. 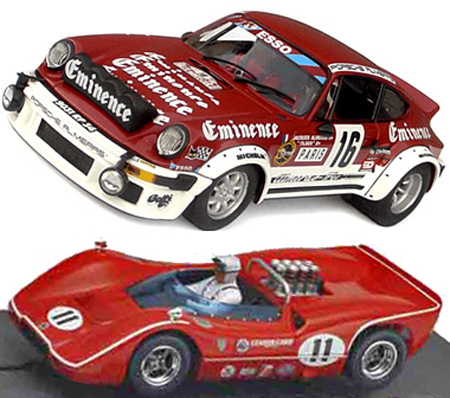 The BBS wheels, wider tires, and the full-face driver’s helmet give the car the look of a Lola being campaigned in Sports Car Club of America amateur racing in the 70s or 80s. 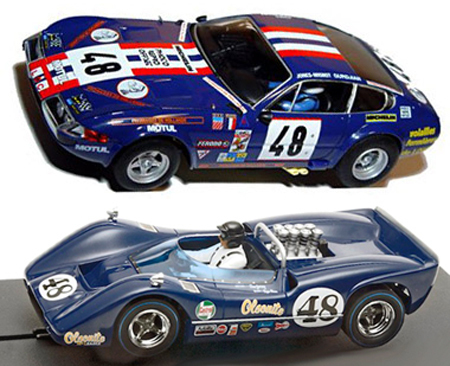 Such cars were always under continuing development with updated components throughout their active racing careers, and some raced into the 90s before being restored to their original specifications to begin a new life as vintage racers. 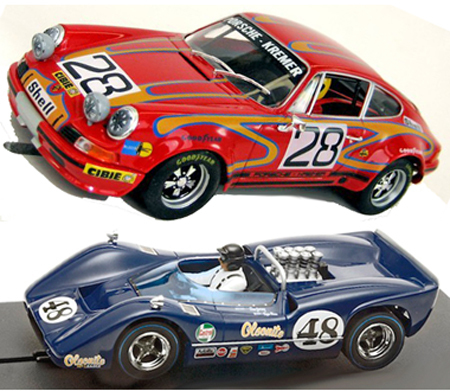 The Fly chassis as we have modified it makes the Lola quick, good-handling, and drivable on our Scalextric Sport track, even with the stock Fly tires. Available aftermarket tires will give it even m,ore grip. Monogram Lola bodies are available separately on the the Electric Dreams web site so you don’t need to buy a whole car to get the body. If you have questions or comments about this article please send them to support@electricdreams.com.